Multiple software systems -- particularly, multiple enterprise resource planning (ERP) systems -- are a problem facing a surprising number of organizations today. There are some important downsides to having multiple systems at work, too: complexity, cost, inflexibility and lack of accurate data among them. What is an organization to do? Consolidate through integration. 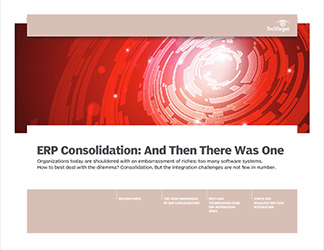 In this three-part guide, readers will take a comprehensive look at the myriad rules and repercussions integral to the success of any ERP integration project. To begin, Rajeev Ranjan, senior associate consultant at Infosys Limited, outlines the four factors that must be assessed before igniting any ERP consolidation plan: business process, user perspective, technology and cost. Next, we dig into the mobile and cloud computing technologies further complicating ERP processes today. While they alleviate many challenges with ERP integration, they prompt a host of new ones. Now that we have covered where ERP is today, we close with a look at where it might be tomorrow. Specifically, how the increasingly blurred line between ERP and supply chain management will influence future integration projects.